This letter was written by 20 year-old Pvt. Heber McCord (1843-1909) of Company D, 32nd Pennsylvania. Heber was the son of Pearson Davis McCord (1812-1885) and Susanna Painter (1813-1851) of West Nantmeal, Chester County, Pennsylvania. While the 32nd Pennsylvania served in the Washington D.C. area in 1863, they were attached to the 2nd Brigade, Pennsylvania Reserves Division, XXII Corps. Heber wrote the letter to his older sister, Mary (“Mami”) A. (McCord) Bull (1837-1920) — the wife of Philadelphia druggist, William Hunter Bull (1836-18xx) whose apothecary was located at 1429 Market Street. William was the son of Elijah and Harriet (McGowan) Bull of West Nantmeal, Pennsylvania. Heber also mentions his younger sister Emma Suzanne McCord (1849-1919) in the letter. I received your welcome letter in due season and was glad to hear from you. When I returned to the regiment — which I did on the 15th of May — I found it at Alexandria where it remained about two weeks after I got there when we moved to this place which is about three miles further up the [Potomac] River for the purpose of quartering convalescent soldiers and parole prisoners. Our duty here is heavy. We get on guard every other day yet this is preferable to marching in the hot sun. How long we will remain in this place, it is impossible for me to tell. I have been under the doctor’s hands for the last two weeks as I had a very bad spell of dysentery but I have got a good bit better and expect to return to duty again in a few days. You complain about me not writing to you as you had written two letters and received no answer. In the first place, your letter to me while at home was but a request to send them clothes down which I did. Then you were living in Market Street. After that, I heard you had moved but where I did not know. I might write you a letter but where would I direct it. When you wish to write to me, all you have to do is to direct to Washington D.C. — always the same. But not so with you. If it is, I know nothing of it. I must have your directions which I had not previous to your writing to me since my return to the army. There was two brigades of our division engaged in the Gettysburg fight but ours was not. Excuse all mistakes and write soon. I remain your brother — Heb M.
P.S. 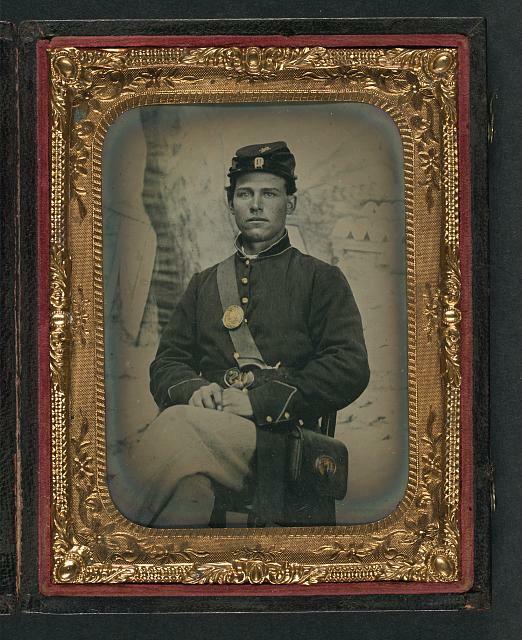 I wrote Em a letter about three weeks ago with my ambrotype enclosed. I have received no answer yet.